The Bruce Laurel Saddle Oak 3/4 in. Thick x 3-1/4 in. 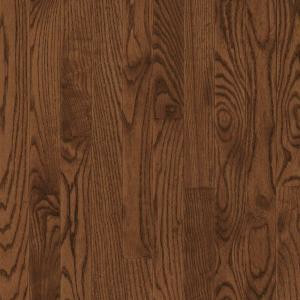 Wide x Random Length Solid Hardwood Flooring comes in a dark color with a high gloss. The planks have micro beveled edges. It can be installed by nailing it down. This solid hardwood flooring offers a traditional look for the interior of your home. You may coordinate trim and moldings (sold separately) for a complete and professional look. It has a Janka wood hardness rating/resistance to denting of 1,290. 22 sq. ft. per case Case weight: 56 lb.